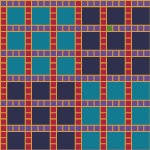 Currently viewing the category: "Pattern"
I’m pretty happy with the final results of this pattern study. As simple as it appears, it seems to have endless color possibilities, and better: it has one or two satisfying quirks that elevate it beyond mere “floral”. Returning to this awkwardly-named, but endlessly-intriguing motif, I filled a few more pages in a sketchbook and decided to pursue a loosely drawn “garden”. I find it half fascinating, half maddening. 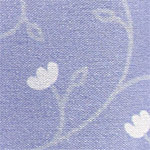 It can be bulbous and comical or elegant and mysteriously harmonious. 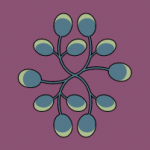 Its leaf-like form and the fascinating ways it can tightly repeat make it seem archetypal. One site’s onion is another site’s paisley, ogee or persian pickle, and the meanings of all those terms overlap and blur. 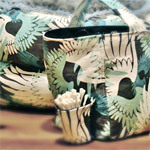 Lisa Flores sews practical items for people and pets. She has an etsy shop, ekeka, where she sells custom and made-to-order cat beds, custom dog bed covers and cat clothes. Her cat clothes are mainly for hairless sphynx cats. Most of the time (but not all of the time), a website background should stay in the background. It should provide just enough color, just enough interest and style, and set the stage for your foreground content to do the talking. To promote my seamless patterns, I’m offering a colorful, high definition (2048 x 2048px) set of my most popular pattern, Leafy Vines, as a free mobile wallpaper. 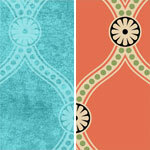 Here’s my first offering of what promises to be a torrent of damask patterns, available now on Creative Market. 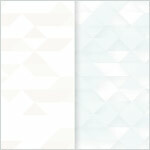 Continuing to play with downloadable pattern backgrounds, I’ve added this new seamless geometric pattern. The package includes layered vector files (.ai and .eps) as well as two transparent .png files (in two different scales). 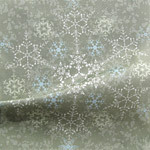 This pattern collection is inspired by the intriguing beauty of the colors in a snowflake pattern I created last winter. The coordinated set is now available for purchase on Spoonflower and continues to tell the story of a still and quiet winter wood. The palette is simple (and was developed spontaneously). Maybe that’s why it works so well across so many uses. 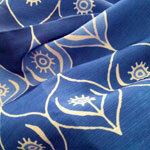 Look for new patterns and pattern colorways, scheduled for release about April 23. 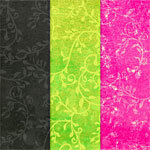 They’ll be available as fabric, wallpaper, wall decals, and giftwrap, too. 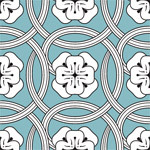 Just added to my shop on Creative Market, this new pattern tile was sparked by a 17th century Dutch motif. 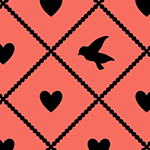 Exploring a simple lattice-and-heart design, I found a way to add a little surprise factor with just one or two bird silhouettes. Get these pillows (or just the covers) on Society6. 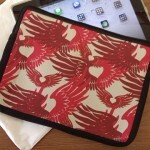 This laptop sleeve is available in all sizes, and a few different color combos, too. A customer just sent me this photo of hers, fresh out of the delivery package. 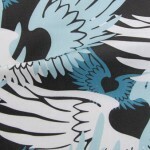 These fabric patterns were originally inspired by a Spoonflower camouflage design challenge, but have continued to evolve. I was looking for a way to express the feeling of freedom in a way that explores some alternate paths we take to create it.